When Gabby Casola first left her hometown of Chandler, Ariz., to visit IU Bloomington, she knew immediately it was the place she wanted to spend her college career. "I had been to other campuses, but when I came here I felt like it was the place for me," she said. "I remember driving down the road and the stadium came into view and I said, 'Dad, this is where I need to be.'" But Casola, a junior studying tourism, hospitality and event management, was still nervous when the time came to actually move her life to the Midwest. "I was petrified coming into orientation," she said. "Coming from Arizona, I knew zero people, so I had to take extra steps just to meet people." But thanks to a warm staff and a welcoming student body, it didn't take long for Casola to feel at home. Fast forward two years later, and Casola is the one welcoming incoming Hoosiers as a student orientation leader for First Year Experience's New Student Orientation program. 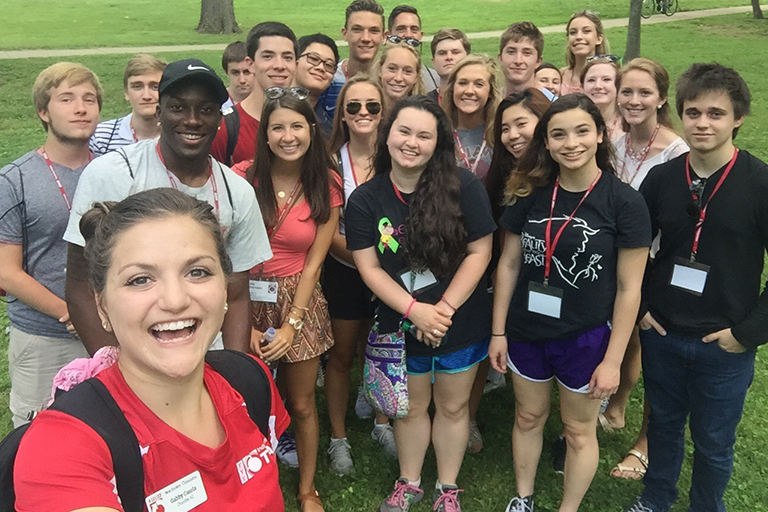 Casola takes a selfie with some of the students she leads as part of IU's New Student Orientation program. Photo courtesy of Gabby Casola. "It is such a rewarding experience," Casola said. "It feels good when students tell me they feel more comfortable being on campus or they are less nervous because of me, or seeing students who are quiet at first, talking and having a good time by the end of the day." A typical day of orientation starts with Casola meeting with a group of 16 to 20 students to first provide an overview of what the day will entail including learning about the basics such as obtaining a student ID, watching a musical addressing aspects of student life and preparing for academic advisement and course registration. That will be followed by a night of connecting with other students and the IU campus in a fun way including a tour of campus legends as well as music, volleyball and games at the Union Street Center. Orientation leaders like Casola are with their students throughout the day, keeping their energy up, answering questions and, most importantly, giving a student's prospective of life on the Bloomington campus. 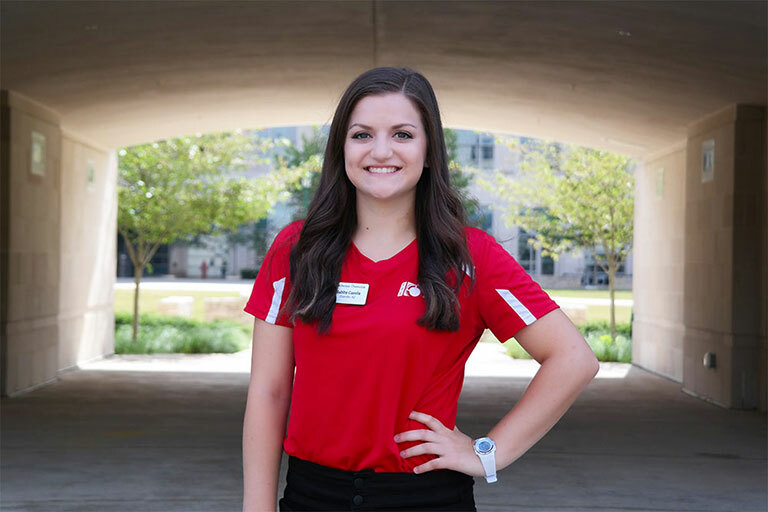 "There are a million things the administrative staff and director staff can teach incoming students about the campus and our resources," said Brittany Krieble, program coordinator for the Office of First Year Experience Programs. "But when students come here, they want to hear the student perspective, so we couldn't do this without our student leaders." Some of the more common questions asked? "A lot of students ask me about advising and registration: What classes do I take, will I get the classes I want?" Casola said. "They also ask about basketball and football -- how to get tickets, how much does it cost. They'll ask me about my favorite experience from freshman year and about living in a residence hall and how I made friends." Gabby Casola is a junior studying tourism, hospitality and event management. Photo courtesy of First Year Experience. It's the making friends part that Casola is sure to share. She met her neighbor, who is now her best friend, one month after moving into her dorm. "I tried to reiterate to them that everyone is scared at first, so don't be afraid to introduce yourself," she said. While orientation leaders are beneficial to incoming students, Casola said she too has benefited from serving as an orientation leader. Not only does she enjoy the people she works with, but leading a group of strangers has allowed her to open up more and to feel more comfortable starting conversations with people. It's just another reason to love IU, she said. "The people I work with are some of the greatest people I've met," Casola said. "They love IU, having fun and sharing their experience and knowledge with others. I wake up each day looking forward to going to work and making someone smile."